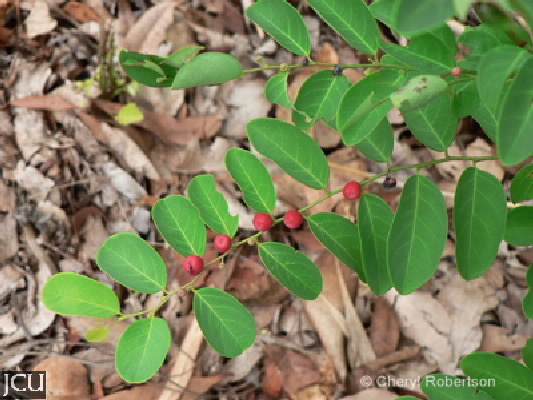 This shrub is usually less than 2 m tall, leaves alternate usually in the one plane, oblong to elliptical to 3 x 2 cm dry blackish; lateral veins do not form distinct loops near the margins, 4-6 per each side of the midrib. Flowers small, greenish, axillary, fruit red to 6 mm diam. 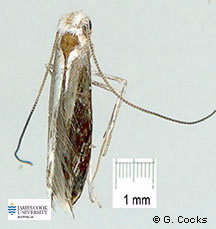 This plant is associated with the a moth in the family Gracillariidae in the genus Epicephala.